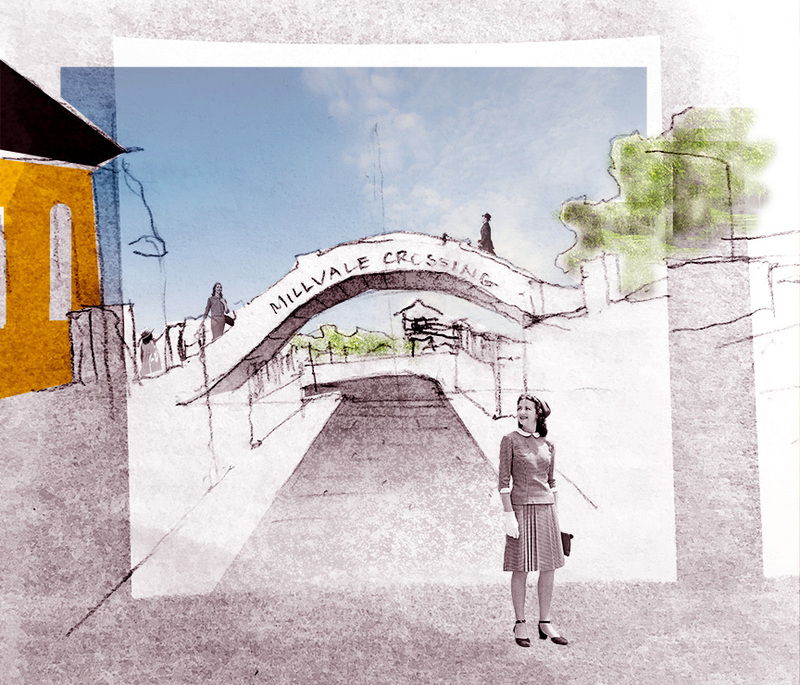 Primarily focusing on reviving the commercial culture in Millvale to form an iconic identity at its gateway, we imagined that the collection of diverse local businesses of Millvale’s heyday be reintegrated into the fabric of the town. 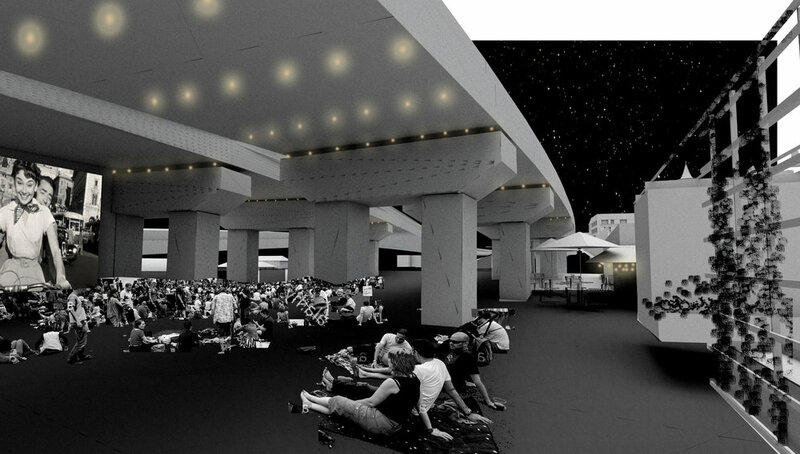 We proposed a series of strategically-placed low-cost, short-term events to discover the demand for commercial & recreational amenities that incrementally grow interest & incentivize long-term investment. This drives an image of a historic Millvale, while looking to its future with a unique, innovative, active community. With each trip to Millvale and our research on the history of the borough, we noticed the variety and quality of storefronts that line both North Avenue and Grant Avenue. North Avenue has retained the character of a classic post-industrial American commercial corridor, lined with specialty shops like Esther’s Hobby Shop, Lincoln Pharmacy, Jean-Marc Chatellier’s French Bakery, Tazza d’Oro, & more; as a result, the image of North Avenue is perhaps the most recognizable as Millvale. But this quality of locally-owned specialty shops fades as you traverse southeast on Grant Avenue; for some reason, the main entrance to Millvale off of Route 28 is devoid of the identity central to Millvale’s image. The EcoDistrict Plan emphasized this lack of a strong entrance as well, planning for this site to be another commercial anchor for the town. We heard from many Millvalians a desire for Millvale to be known regionally as a “foodie” haven: a destination where tourists could travel to sample a diverse range of artisanal fare. Using food and other “destination retail” like Pamela’s Diner, Attic Records, and Yetter’s Candy is a powerful way to reframe Millvale’s image as an innovative town while simultaneously opening up new opportunities for investment. Our proposal focuses on building intrigue surrounding these ideas of food and destination retail using incremental, small-scale interventions to drive interest in long-term investment. At its final stage, this proposal adds 7 food retailers, 6 diverse retailers, 3 new public park amenities, 10 conventional housing units, and 10 co-housing units. Where residents and visitors enter Millvale, on E Ohio Street (locally called the Curve), they encounter a street that does not feel like Millvale but resembles more closely a highway, making it dangerous for pedestrians to even attempt crossing it to get to the riverfront park. The disorganized and overwhelming number of signage and traffic lights confuse even experienced drivers. It is within all this chaos that the path that leads to the popular St. Nicholas is hidden. One needs to walk on a sliver of a sidewalk to get to the church. Furthermore, a berm supporting a four lane highway, a ground-level railroad and an elevated railroad completely separate the river and the riverfront park from the town. In 2012, the Borough of Millvale teamed up with evolveEA, an architecture and sustainability firm, to begin the implementation of the EcoDistricts Protocol. In its first phase, Millvale chose to focus on three areas: energy, food, and water in order to combat the ever-present energy crisis and its financial burden, to solve the food desert condition of Millvale, and to mitigate the problem of flooding. Three years later, the community expanded these goals to include air quality, transportation, and equity. The Millvale Ecodistrict Pivot Plan marks an important change of attitude in Millvale, outlining both the historic and existing issues the Borough has faced, while also recording the residents’ vision for its future. Having this written record of Millvale’s goals is crucial in shaping the development of the community, resulting in investments and real projects that solve real problems. 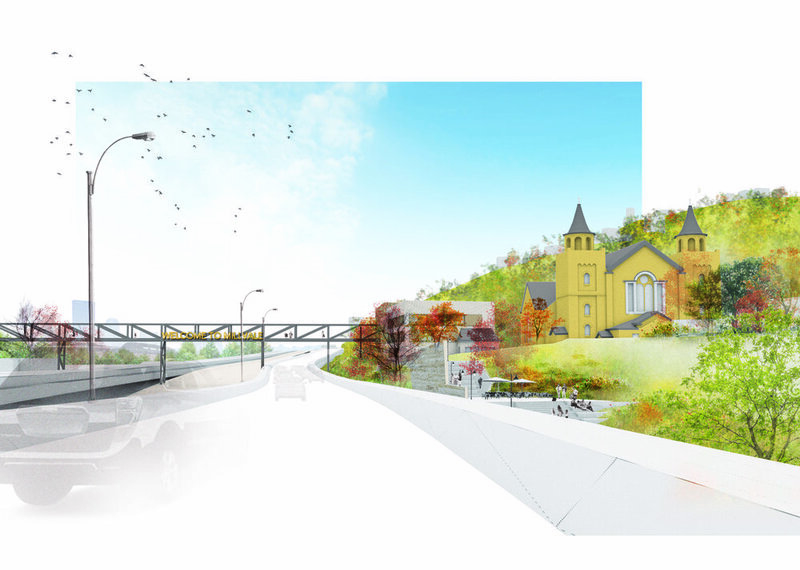 Also from the EcoDistrict Plan came the adjacent image, showing a future vision of Millvale. 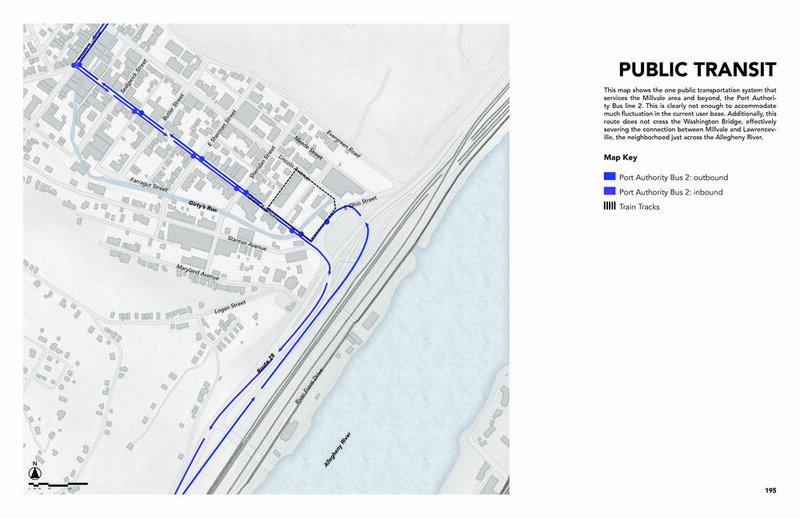 In our attempt to continue the goals outlined here, we borrowed some of these suggested programs and, with each project, site them closer to the “gateway of Millvale,” a site selected by evolveEA to serve as a primary commercial center at the entrance to the town, as well as the connection to the Allegheny riverfront. The development of these sites, in alignment with the EcoDistrict Plan, will hopefully rejuvenate Millvale. Though ambitious, we strongly believe the achieving the goals outlined in the EcoDistrict Plan to be entirely possible; however, the typical community development model doesn’t tend to facilitate the prescribed resilient, equitable situation. 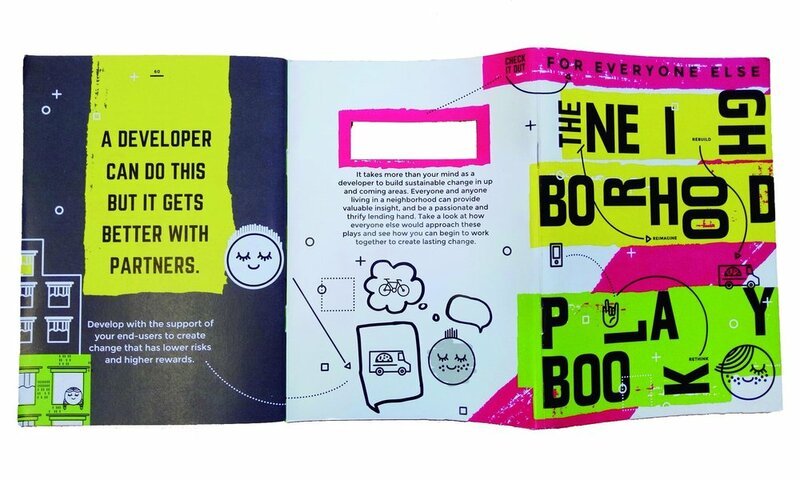 Our studio had the opportunity to work with the creators of The Neighborhood Playbook, a book meant to educate both developers and communities in establishing new development models that put residents first, a mentality that is mutually beneficial. All too often, in the conventional development model, early entrepreneurs who invest in economically-depressed areas carry much more risk when first investing in the place, forcing these developers to reduce their risk in other ways. In towns like Millvale, this usually manifests as a national chain restaurant or retail occupying a relatively valuable location in the town, while not truly making that place any better, on the scale of the local economy or social fabric. The Neighborhood Playbook, however, advocates for a people-first development model based on community engagement at all stages of the design and development process. We saw the success of this model first-hand while visiting the book’s creators, Kevin Wright and Joe Nickol, in Cincinnati, Ohio, where they’ve tested and refined this method over the last decade. Walnut Hills, a neighborhood on the outskirts of Cincinnati, has a similar history to Millvale. After stumbling upon a neglected plot of land, Wright and Nickol staged community clean-ups, followed by regular “block parties” with overturned buckets as stools and a keg of beer as low-cost strategies of getting residents to activate this newly-programmed space. When a local entrepreneur brought his food truck to one of these events, he saw the potential of the space and purchased an adjacent building, evolving the food truck into a restaurant. That neglected space is now known as Five Points Alley and has acted as the incubator for progress in the up-and-coming Walnut Hills neighborhood. This approach of small-scale interventions that lead to long-term investment builds in demand from the start, rather than relying on a supply to beget the demand later. This minimizes the risk to early entrepreneurs, incentivizing even more investment in the town. But most importantly, this new model for development puts the needs and wants of the community first. So, in this vein, we revised our original project prompt as not simply envisioning the long-term proposal, but also organizing phasing strategies in order to actually achieve these goals. 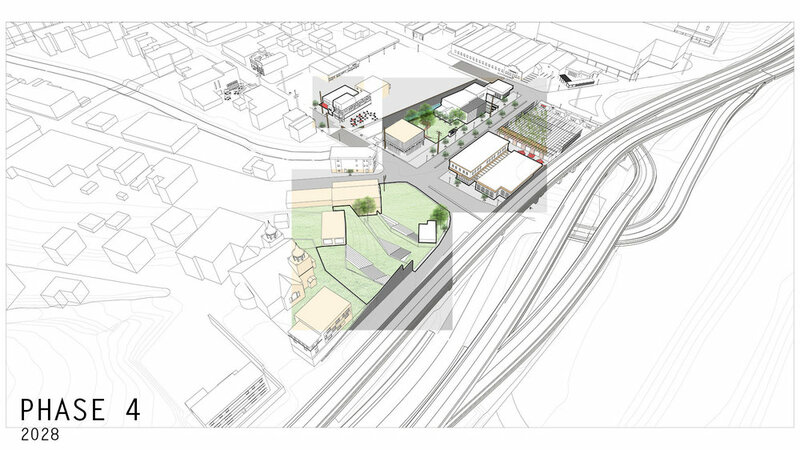 The above phasing strategy is designed to eventually build a new headquarters for an existing local non-profit organization at a highly-visible corner near the entrance to Millvale. With intensive research into the ecological, social, and economic structures that construct the town, careful examination of the goals outlined in the EcoDistrict Plan, experimentation with the new model of development advocated in The Neighborhood Playbook, and active engagement with consultants, local stakeholders, and community members, our design teams worked for the semester to deliver this report of our final recommendations for the revitalization of Millvale, particularly at its gateway. 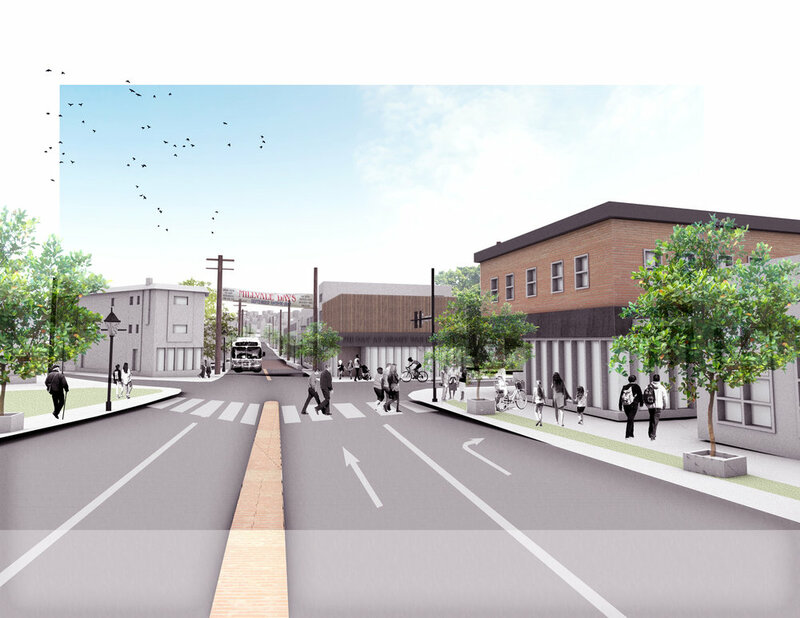 Our final recommendations for the future revitalization of Millvale's EcoDistrict Plan hopefully reflects the aspirations of Millvale, prescribing a means for their vision to become a reality.